How long does it take to build a custom mobile business? What are the costs associated? How long does it take to have a BBQ Trailer built? Get answers to these questions & more here! How much does a truck like Tropic Crust cost? There are many variants when it comes to pricing a truck like this. We can always provide pricing based on your specific needs. All you have to do is ask. What kind of pizza oven should I buy? Perhaps the most important choice is picking between gas or wood fired. I'd like a trailer but can find one to suit my needs. We're always excited to create something new. We can fabricate a trailer of your design from the ground up. What type of flooring should I use in my Trailer? Generally we recommend materials that are wipeable for easy clean up. I'd like a larger trailer but don't possess a CDL drivers license. No worries! We never build trailers that require a commercial license. How much does a custom food truck cost? To fabricate a food truck the starting cost will be 19k. This price does not include the truck itself or equipment. Do you sell prefabricated trucks? No, we do not sell premade trucks. All of our trucks are built custom to your needs. How long does it take to build a food truck? It generally takes about 6-8 weeks for us to fabricate. Depending on the complexity of your truck and/or customized changes it can take longer. 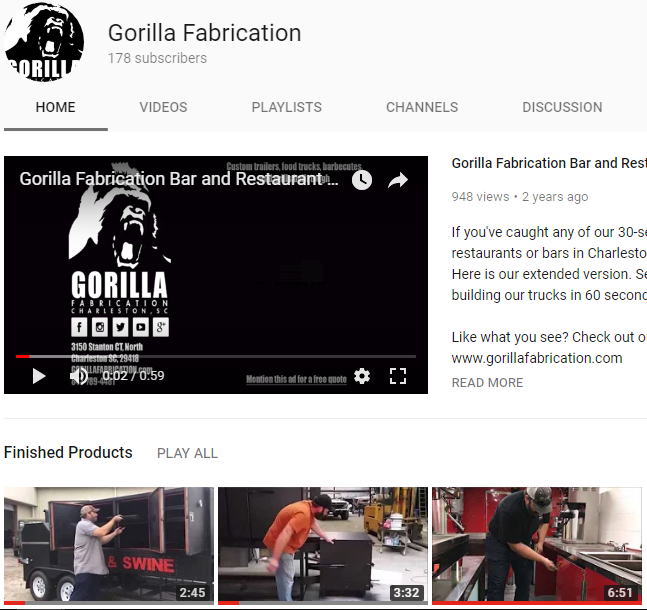 Can Gorilla Fabrication help source a truck? Yes, we can source a truck or utilize your vintage truck. Can I make my own customizations to my food truck? We love challenges and creative ideas. Bring 'em on! What are my local health department regulations? Most areas of the country have different ordinances in place. We can help you with a consultation to get you started. Do you handle exterior design? Our paint booth is outfitted to any size vehicle. We are able to cut and install vinyl in-house. I'd like branded metal signage for my mobile business. Our plasma cutter is capable of cutting any type of metal sign large or small. Can you extend the tongue of my camper? What do I do if my camper has wood rot? In most cases, we remove the wood and reframe the camper. How much does a custom BBQ trailer cost? A BBQ trailer starts about 3k and go up depending on what you want. How long does it take to make a BBQ trailer? It usually takes 4-5 weeks to make a barbecue trailer but can vary depending on month and demand. Do I have the option to pick just Charcoal or Propane? I have material I want cut, can you do it? Yes, we can sheer your materials. We can accommodate 1/8 inch up to 10ft wide, 3/16th up to 5ft wide, 1/4in and 1 inch up to 2ft long. We can also use our CNC plasma table on up to 3/4 inches of material. Do you do welding and fabrication repairs? Yes, we do welding and fabrication repairs. Tig welding is $90 an hour and all other repairs must be quoted by job. I want to purchase materials, how much do they cost? Prices vary depending on the market but we do guarantee the lowest prices in town.